FAQ - Get Answers to Prepare For Your Next trip from LA to Joshua Tree, Yosemite, or Death Valley! - Come adventuring with us! Q. What﻿ should I bring? A. Check the specific Adventure Tour page you're interested in. Scroll down to find the "What To Bring" list. Since the length of each trip and activities may vary, we've tailored the list to each trip. A. The basic tour package includes departure/arrival at a pre-arranged location near Los Angeles. There's also an option to end your trip in San Francisco for our Yosemite Adventure. You'll enjoy traveling in your own vehilce during the tour (with the option to have the guide do the driving), all meals prepared within camp, snacks, and water. You don't have to worry about any park entry fees and camping fees. We also bring all the major camping equipment --tents, insulated mattress, and "camp kitchen" equipment. Q. So Southwest Adventures does not provide transportation? A. That's correct. For many years we provided a tour vehicle but chaged that recently in 2016. Because our tour groups are small, the extra insurance and other fees made it difficult to offer our trips at a price we felt was resonable for most of our clients. With our new policy, you provide the vehicle and we provide everything else. Your guide will meet you at your home, motel, or even a car rental agency. We have relationships with some rental agencies, just call us to see if we can provide a discount if you want to go this route. Q. Is there a requirement for the type of vehicle? A. For 1-day tours, the vehicle just needs to be able to seat everyone in your group + the guide, no other requirements. For overnight trips, there needs to be enough space for the camping equipment, food, and luggage so we recommend giving our office a call at 1-800-851-6018. For smaller groups, a small vehicle will be sufficient, for larger groups a large SUV or maybe even a large passenger van would be required. We have relationships with several car rental agencies in Los Angeles, and can often help you find discounts on rented vehicles. Q. I've never camped before, how does this all work? A. It doesn't matter if you're a veteran backpacker, or a city-slicker looking for a rustic adventure --our group leaders are here to make sure you enjoy yourselves, while keeping your trip on schedule. While this is your group leader's primary role, we also handle all the little details to ensure your trip runs smoothly. We don't want you to worry about planning, camping reservations, logistics, and little travel details. Just arrange a trip with us, and enjoy your adventure! Q. Do I help with food and camp setup? A. While your Group Leader takes a role in camp setup, and major meal preparation tasks, we also count on the generous support of our adventurers to help from time to time make it all happen. Your group leader may ask for your help with some tasks, like setting up and breaking down camp, and some meal prep. If we all work together to help out a little, it goes a long way and makes the trip better for everyone. Q. Does food cost extra? A. Meals prepared in camp are included in the cost of the tour and are prepared by your Group Leader with the help of yourself and fellow passengers. This accounts for at least 70% of your meals. Any meals outside of camp are NOT included with the cost of your reservation. Q. Is the food good? A. Most adventurers think it's fantastic! Q. What is a "camp breakfast"? A. The breakfast prepared at camp can be anything from delicious warm omelets to cereal and fruit salad. It all depends on how long we have each morning to cook. For multi-day trips, we try to have 1 fancy breakfast (omelets, french toast) per trip, with the rest being quick breakfasts to give you more time to view different parks we visit. Q. Do I need to bring my ID, passport, or visa? A. Yes --you'll need to bring some form of identification 1) to show your group leader when he initially picks you up and 2) if you plan to buy alcohol or go to any bars while on the trip. You may need to bring a passport/visa if you are coming from outside the country, check with your local embassy to make sure. Q. Where do we camp? A. 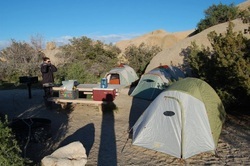 For the most part, our trips camp in United States National Parks or National Forests. We may also stay on private land, which usually include shower facilities or a hot spring. A. Sorry, no furry friends. "But little Sparky's really cute!" We're animal lovers too, but we just can't bring them in all the locations we're heading to. Q. What if I don't like camping? Should I book an Adventure Tour? A. If you've made up you're mind that you won't like camping --probably not. We spend lots of time outside hiking, cooking, etc. --and some of the facilities we use are quite rustic. Try The Joshua Tree 1 Day Extravaganza, which doesn't include an overnight camping stay. Q. For overnight camping trips --are there toilets and showers? A. Yes, there are bathrooms stops with toilets on our trips. However, during longer overnight camping trips, there may be campsites with pit toilets, and showers will be available every 2-3 days. Q. How difficult are the hikes on the trips? A. There are a variety of different hikes available at each of our stops. You can spend all day hiking if you want, or spend the whole day in camp, it's really up to you. Q. My friends and I want a custom﻿ Adventure Tour. Can you help us plan our trip? A. We offer custom trips for groups of 3 or more. Contact us with details to get a quote! A. We gladly accept major credit card payments through Paypal. Scroll down on each Adventure Tour page, pick your dates from the drop down menu, and click the "Buy Now" button. If you're unable to pay by credit card, please contact us and we may be able to work with you to find another payment option. A. Full payment for most trips are due at the time of your reservation. For the Yosemite Adventure, a $200 deposit is due at the time of your booking. Full payment for the trip is due 60 days before departure. This means that if you are booking a trip that leaves in less than 60 days, we will contact you immediately after you make the deposit so you can make the full payment. If you fail to pay the balance owed before 45 days from the departure date, we may release your spot to another passenger. A. If you cancel 60 days or more before departure, you'll get a refund minus a $50 processing fee. If you cancel your trip between 15-59 days before departure we'll refund all except the $200 deposit (which may be applied to a future trip, minus a $50 processing fee). No refunds are given if you choose to cancel your trip 14 days or less before departure. If we're able to sell your spot on the the trip after you cancel, we MAY refund all your reservation minus the deposit. Q. Will Southwest Adventures ever cancel a scheduled trip? A. On very rare occasions we may cancel trips due to weather, wildfire, or other circumstances beyond our control. In rare cases where this happens, we'll either refund your full payment or credit you that amount towards another trip. The choice is yours. A. We'd love to have that kind of cancellation policy, but cancellations cost time and money. When there's a last minute passenger cancellation, or custom tour cancellation, we endure extra costs. When you make a reservation, you secure a spot on a scheduled upcoming adventure tour. Cancellations mean other potential Adventurers may have been turned away. On custom trips, reservations are made for campgrounds, guides are scheduled, and other groups/Adventurers may have been turned away who wanted to book us for the same time period. Contact us if you have any other questions! We're happy to answer them. Get A Quote On A Custom Tour!